- The language is always in a situation (has direct relation to a child and his needs). - The language has purpose (it’s about NOW and HERE). Two main approaches to presenting grammar nowadays are: Deductive (Form-Meaning-Use) and Inductive (Meaning-Form-Use). We need to match the way we teach with the way children learn. The inductive approach is more natural and is used by most authentic books. 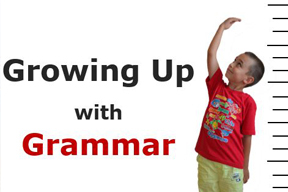 Students at this age don’t need to understand grammar – they need to use it. You can highlight a lot of grammar implicitly without using grammatical terminology, simply by giving patterns and structures that children can play with and appropriate for themselves. Grammar is incorporated into other activities (games, listening and speaking activities). The meaning of the grammar structure is introduced in a context (situations that are related to kids’ lives) - stories, pictures, children’s life experience. After children are exposed to the target language, they need opportunities to use English to communicate with others. Further recycling of the grammar structure during the course is very important. New Grammar is introduced through familiar vocabulary. Kids want security. 2. It is the teacher’s responsibility to attract children’s attention to language forms and make them aware of accurate language use both orally and in writing. 3. Students study the rule in the book – by this time they must be familiar with the form. 4. Lots of practice (both oral and written use). Avoid making learning the grammar terms the focus – the purpose is to learn about how language works! Teaching Grammar is always integrated with teaching vocabulary and skills! Remember about the value of grammar games: make your grammar lessons more fun! Give each student a label (a piece of paper) and ask them to draw an item from the topic you want to revise (classroom objects). Collect the items and stick or fix one on each pupil’s back. Pupils can’t see what is on their back. The aim of the game is for students to guess the object by asking questions (Is it a book?) Students mingle and ask and answer questions. Prepare an envelope/ a box which you decorate with yellow bananas. Divide the class into teams. Show a pupil from team 1 a flashcard. If he correctly states the content of the card (a simple sentence), he is allowed to shoot at a specific target (a bin or a box) with a ball of paper. If the ball enters the target, he is awarded 2 points. If the ball hits the target without going in, he is awarded 1 point. Invite several students to the board and give them a different flashcard each. Students hold their flashcards up to show the class. Ask Who’s got the (cat)? Students answer ...’s got the cat. Students have to say the name of the pupil who has that flashcard. Dictate silly/funny sentences (e.g. The horse is dancing on the tree.) Students draw pictures. Students then reproduce sentences from their pictures. Students put the words in the correct order to make a sentence. Draw a large race track on the board. Divide the class into two teams. Use small coloured circles to stick on the board as markers for each team. Ask questions (What’s this? How many?....) Pupils move ahead one space if they say a correct sentence. The winning team are the ones to reach the finish first. Use objects or flashcards – different sizes and colours. Choose one of the items and students will have to guess it by asking questions. You can only say YES or NO.